This is the 10th year I engaged in the project management area, but what I used to do is not only project management. My talent is to collect and analyze information around me and set a target or plan via the information, and then, reach the target. The final goal is to grow and achieve business, even an idea, which has potential, valued and meaningful. What I have done, what I have earned, all my experiences in the past, are not only the dedicated achievements for a position or a plan but also the performance of my career idea. With my work results, I earned the trust and recognition from all stakeholders in the past. Well communication skill, be able to connect the cross-organizational team (different company/department/role) and guide people to the same goal. Well project/program management skill, be able to make reachable, effective and flexible plans in dynamic situations, and also smooth the impact from temporary issues. Ability to understand and fulfill the real needs of stakeholders (both internal and external), thus to build/improve professional relationships with them. Considerable understanding of product/service planning and life cycle management (including requirements, feedbacks, budget, risk and resources management). Extensive experience in achieving a new service (product) or integrating multiple systems/service. Familiar with Scrum and SQL database. *In short, I'm a good planner and communicator who owns foundation programming knowledge. 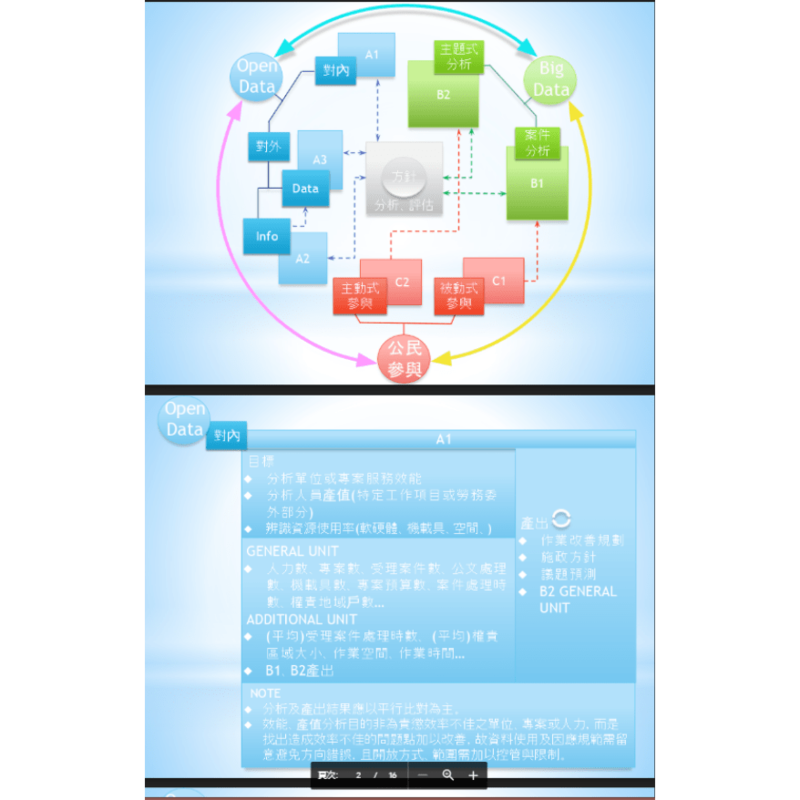 Lead business group (including AM, CS, BA, SA, UX/UI, R&D, and QA team) to develop new-build B2C (combine O2O) Cloud Education platform (SaaS), and create B2B brand that includes 3 platforms (web + APP) and operates on U.S., China, and Taiwan clients in education and financial area individually. Understand/analyze the needs that came from clients, users, or internal operation team. Set development target and co-work with design and development team for detail spec. And then, make the development plan according to the design (spec) and team capability. Continually improving the way of document management, communication, and integrated workflow along with flexible development plan, to reduce the impact of accidents or temporary requirements. Thus to let the team stable step forward in a dynamic environment. Communicate between cross-organizational (different company/department/role) team and multinational team to resolve issues and implement the development target. Develop and maintain relationships with clients or other project stakeholders. Organize and implement system training for clients. Organization resource control and management. Assist QA with Usability Test for newly developed features. IT Service surveying and planning. (Including public service and internal improvement plan). Transfer policy ideas into executable plans, according to the results of the feasibility assessment, requirements analysis, cost and risk evaluation, system design and communication/negotiation of workflow integration between different departments. Communicate with/between different departments, companies, and organizations to promote the policies or plans. Manage multiple projects, including user requirement analysis, system building assessment, user relationship development, service expansion evaluation, tender works, contracts management, vendors evaluation and management, and crisis handling. 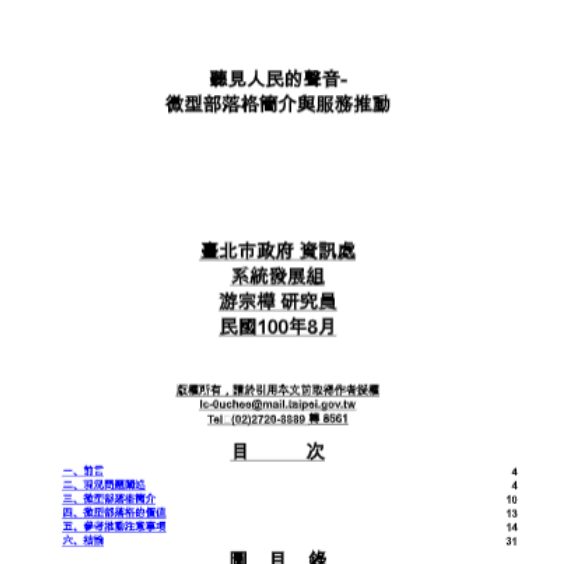 In charge of Taipei 1999 Citizen Hotline IT Service, which is a cloud service that integrated multiple internal and external systems (including CTI, CRM, task process, HRM, reporting, KM, GIS…etc.) along with complicated workflows that related to different departments. Working scope includes the items above. As the results of my work, my department won several awards, please refer to the "Awards" section below. 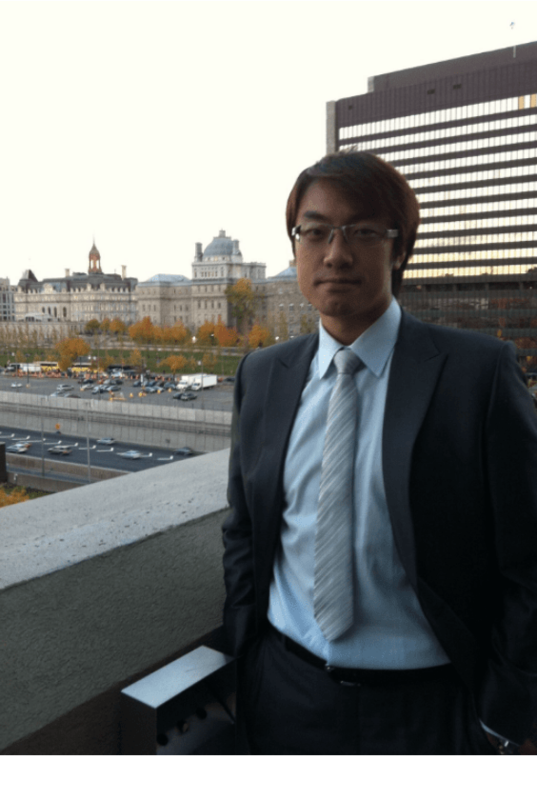 Tsung Chan Technology Consultants Ltd. Using VB .NET, C# .NET and MapGuide to develop web GIS applications that were based on Oracle database. Self-taught MapGuide API and wrote technical manuals for other team members. Wrote project documents and handled issues from the client. Worked on-site with the client, responded to the client's requests and fulfilled their requirements. GIS related Website and database maintenance and management. GIS layers editing and producing. Design and build taxi fleet GIS monitor system. *The project team was organized by my faculty advisor of Chung-Hua University. Majored on GIS application development. Basic Government Purchase Professional Certification. Completed 70 hours of Cisco Networking Academy Instructor Training. 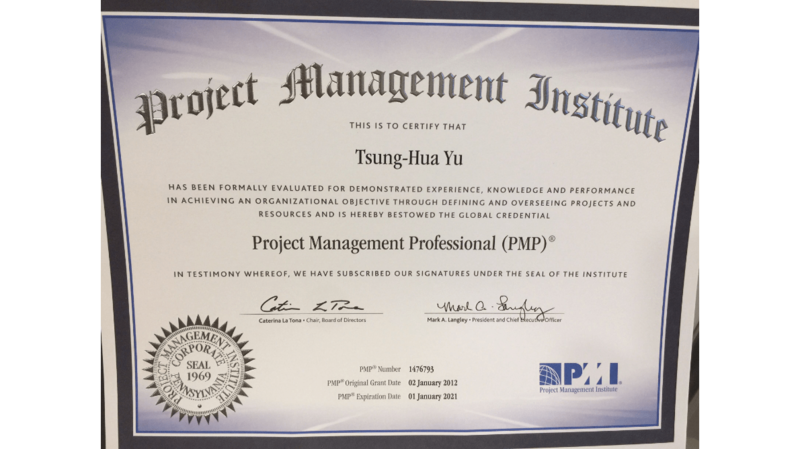 Although PMP is a popular professional certification. In my point of view, PMP is just a tool with the instruction manual. The true value is the ability to handle various accidents and changes in reality, which comes from the integration of professional knowledge, experience, and logical thinking. My communication ability is not only to develop the relationship with stakeholders, transfer information by the easy understanding way to different groups but also to dig the meaning behind the words, collect information for analysis of decision making (for issue resolving or target setting), and even to learn new skills or knowledge. We rarely have a chance to finish a spring without any accidents or changes in CampusCruiser. Therefore, we have created a flexible way to run scrum so that we can handle urgent events and meet the main development target at the same time. GIS is my initial professional knowledge since I studied at university. While I was working in Taipei city government, the idea of my position was to understand the thought of citizens. Found out what people care about, and what we can do. Therefore, I designed an integrated GIS system to analyze the issues reported from citizens, for the reference of policy-making. And then, further to evaluate the effective about the policy. As a PM, it's not easy to present specific working results or ability compared to the R&D. Instead, my team members engaged in my working result at all times. So, let me show you the voices from the team. 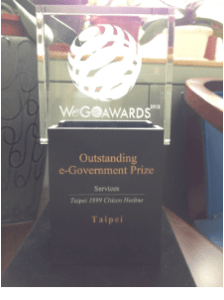 2012 World e-Governments Organization of Cities and Local Governments: Outstanding e-Government Prize. *The competitor of this award is not only including government departments but also enterprises. 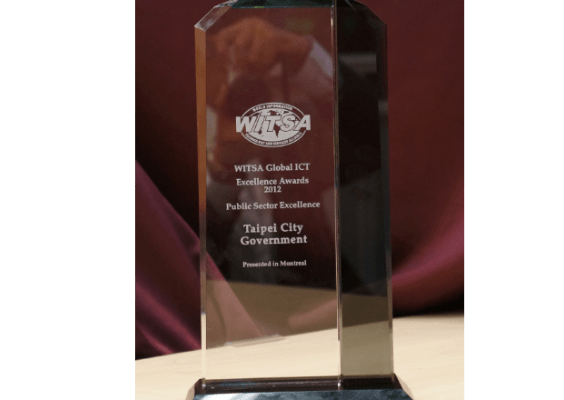 2012 WCIT (World Congress on Information Technology), WITSA Global ICT Excellence Awards: Public Sector Excellence Award. 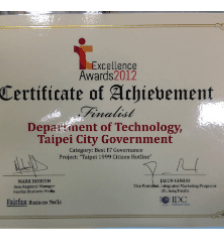 This award is based on the IT service/construction of whole Taipei city. Even so, during the award ceremony speech, the Director-general of the Department of Information Technology mentioned three results of the development of information technology in Taipei City, which is relatively specific and effective. The result of my work is one of them. In 2011, I have put forward a plan "Interact with the public via micro-blog", just as the same as what social media manager do today. This plan was recognized but not able to implement due to the conservative custom of the government at that time. But it's an important way to run a business or represent (political) characters nowadays. "Citizen Participation" that raised by Ko Wen-je at the first year of his Taipei city mayor career. As far as I know, there was no specific plan until I made an integration model for them. This high-level model considered not only the feasibility for existing systems or services (and the implement sequence), but also the rule of laws, working process, and even corrupt customs of government departments. The idea was recognized by both heads of Department of Information Technology and Research, Development and Evaluation Commission.